When you’re just getting started and you’re strapped for cash, you typically do all sorts of things to pinch pennies. It’s just part of surviving, and it’s a healthy thing to do when you’re not actually making any money. The danger, however, is keeping that mindset after you’ve got a steady stream of cash flowing. It’s a danger that creeps in to a lot of startups and never goes away, causing generally sane people to do insane things in the name of not spending money. You’re just getting started building some amazing, life changing software. You’re either building everything yourself, or you’re part of a small team. Money is tight (or maybe non-existent). You’re doing everything as cheaply as possible and, for the most part, you’re spending nothing other than your time. Things like A/B testing, analytics and support software aren’t even on your radar because you don’t actually have customers yet. At this point, you’re entirely self-sufficient, providing everything your business needs. But then you launch. You start getting actual customers. You start growing and your business starts to have needs past your core product. You realize there are tools that would be really beneficial for growing your business even more. You start doing research in to ways to better handle support requests, you find your Google Spreadsheet is a pretty painful (if not impossible) way to track your revenue growth, conversion tracking turns out to be pretty crummy with just Google Analytics and you’ve got an idea for your signup page that you’d love to A/B test to see if it increases conversions. You start looking in to popular tools for doing some of those things. And you freak out. $200 per month for conversion tracking? $400 per month for revenue insights? Or maybe it’s something even less. $30 a month for a tool that, on the surface, seems to just be glorified email comes across as a waste of money. You initially just decide that you’ll do without. You’ve made it this far without those tools, so why not just keep plugging away like you always have? But more and more you find that you could really use these other tools (much like your own customers need the tools/services you’ve built). This is where paths fork and two different types of people manifest themselves: Buyers and Builders. Buyers are the ones who decide to just spring for existing tools out there. They realize that, while spending $250/mo for A/B testing stings a little, it will ultimately help them make more money. Builders are folks who balk at that $250/mo A/B testing suite and decide to use their engineering resources to just “whip up a little homegrown A/B testing suite” during a weekend hackathon. That $250/mo stings far too much and “can’t possibly be worth that”. But here’s the problem. That weekend hackathon turns in to a few weeks of “getting it just right” which turns in to a couple of months of distractions for the engineers as they tweak all the random edge cases no one considered. Let’s take a look at some numbers here to give you a real world example of why building is generally an epically bad use of your resources. Say you’ve got a few thousand customers, so you’d be on the $250/mo plan at Baremetrics…and no way on earth ever in your life would you pay $250/mo for anything ever anywhere. Absurd! So you decide you’ll get your team of engineers to build something internally. How hard to could it be, right? In reality, it will take at least a month of engineering time. Maybe not all at once, but the fact is, building an analytics tool correctly is difficult. Especially when you get in to the really useful stuff. It’s just time consuming, whether you like it or not. Let’s assume those three engineers are getting paid, on average, $90,000/year. My 6AM-in-the-morning math tells me that’s $7,500/mo…per engineer. Multiply that by 3 and we’ve got $22,500. Congratulations, you just spent $22,500 to save $250/mo…a Baremetrics account for 7.5 years. Statistically, your business won’t even exist in 7.5 years. But! It gets better! Not only were your engineers focused on building that internal analytics tool, they were not focused on making your actual product any better. Say you were at $50,000/mo in recurring revenue and growing at a steady 10% month-over-month. That means in 12 months you’d be at roughly $155,000/mo in recurring revenue. 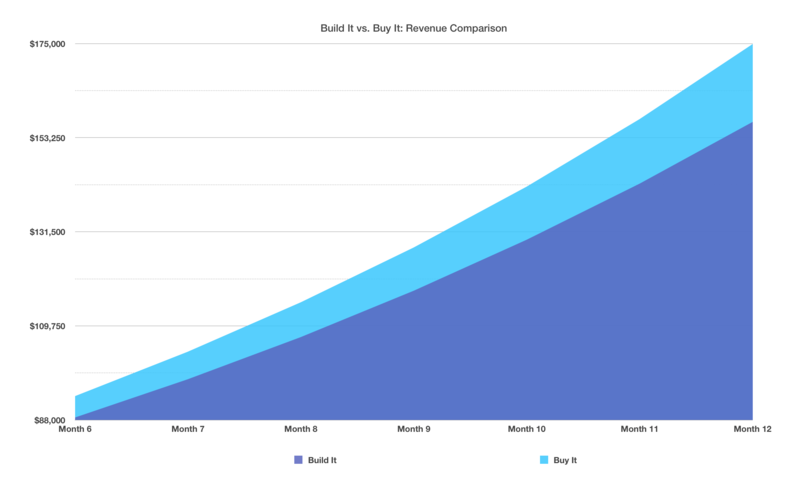 However, spending a full month, heads down, building a major addition to your product that reduces churn and expands your market size could have potentially bumped up that growth to, say, 11% month-over-month. That would have meant roughly $175,000/mo in recurring revenue within a year. An extra $20,000 per month in revenue. And, if we take the actual earned revenue over that 12 months, in both those growth scenarios, there’s an $85,000 difference. That means, in the first year after your cost savings experiment, you spent $22,500 in engineering resources plus $85,000 in lost revenue, for a grand total of $107,500. Sweet goodness. For a long time I racked my brain on this. I just couldn’t think of any scenarios where this ever made logical sense. But I started looking at my own experiences over the years of building companies and noticed some commonalities among all the past customers who’d had major price objections. Across the board, nearly every single time someone got hung up on price, they were a consumer-focused business. Most were charging less than $10 a month for their product. Many were charging more like $2 a month (in the form of a $25/year plan). The interesting thing is that these companies weren’t struggling on the revenue side. Many were making 6-figures per month. Instead, it was a value problem for them. Their entire business revolved around selling a relatively low-value product to a high-volume of customers. They were primed to not place a high value on things that solved business problems for them. This is a realization that’s held true across four separate companies in four separate industries that I’ve run and, talking to other startups, this has also held true for them. Be careful who you take product roadmap queues from. All feedback is not equal. 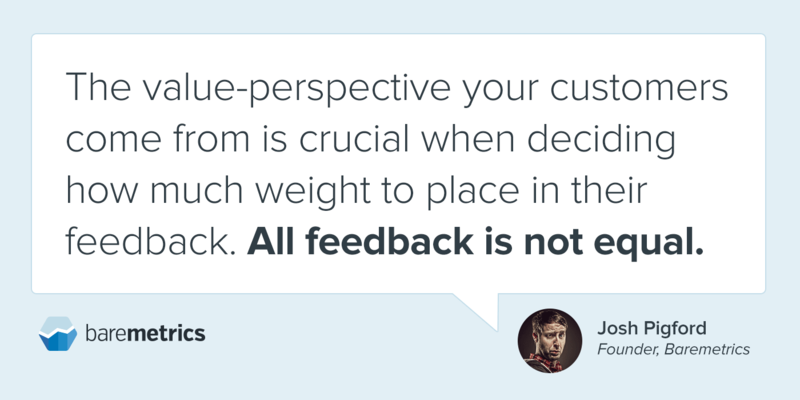 The value-perspective your customers come from is crucial when deciding how much weight to place in their feedback. What about startups who are “pre-revenue”? It’s easy to get in this mindset that having certain tools at your disposal will somehow make a big impact for you. But here’s the thing: tools exist to augment and assist with making money. They, generally speaking, don’t actually generate new revenue for you. A situation I see a lot is when companies want to A/B test their home page when they’re only getting a few hundred visits a day. 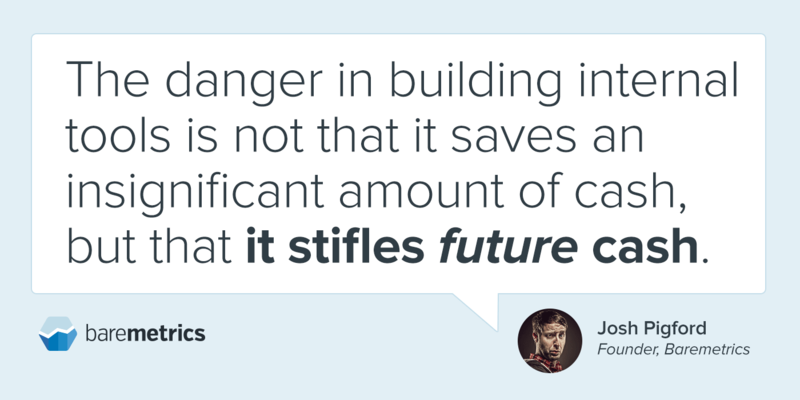 Even if you had a 50% bump in conversions…it just doesn’t matter at that scale. When you’re that early in the game, you need to do things that move the needle in big ways. So what’s the takeaway here? It’s simple, really. Either spend the money to get the tools you need, or just focus on making your own product make more money. But don’t waste your engineering resources on things that don’t make a big, long term impact.